Seattle's Pike Place Fish Market— a great fish market—reels in the world's best seafood recipes with friendly tips and a sustainability approach that every home cook can master. Watch Bryan Jarr and Anders Miller whip up a delicious Maple Salmon Recipe in the Allrecipes kitchen! Rinse the salmon under cold water and pat dry with a paper towel. 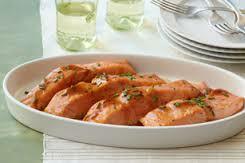 Cut the salmon into two pieces and place in a deep pyrex dish lined with aluminum foil (it’s makes cleanup easier). It’s very important that you don’t put the salmon on a baking sheet because it’s flat and you want the salmon to absorb the liquids. Pour the maple syrup and melted coconut oil on top of the salmon…don’t worry if the coconut oil solidifies, it’s normal. Next squeeze the juice of 1 lemon over the salmon. Cut thin slices of the other lemon and place on top of the pieces of salmon. Place the dish in the oven and bake for 25 minutes. The salmon will be done once it’s flaky and a nice light pink color. I recommend eating this with something green, like broccoli or sauteed spinach prepared your favorite way.